GRAPELAND – While the Texas Association of Basketball Coaches (TABC) released their All-State rosters earlier this month, the Texas Girls Coaches Association (TGCA) just released their All-State rosters this past Thursday. 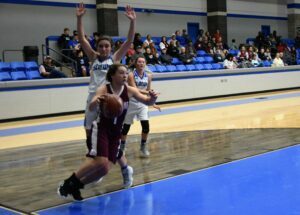 The honors continued to roll in for a pair of Grapeland Sandiettes as senior Hannah Chipman and sophomore Teira Jones were both named to the TGCA Class 2A All-State team. The Grapeland duo helped lead the Sandiettes to the Class 2A State Championship Game where they fell by a final score of 60-56. Both Chipman and Jones were also selected to the TABC All-State and All-Region Teams earlier this month. Kacie Kimbrough, and Lexi Rogers in Class 1A while Palestine Lady Wildcat Destiny Matthews was also selected for post-season honors. Hudson was also selected for Academic All-State honors. All State players are NOT required to be SENIORS. Coaches may nominate as many players as they choose. All conferences shall have 40 athletes selected per conference for All-State honors. Next articleWatts Signs with Paris Ju. Co.